It’s hot. Have I mentioned that? This is normal for Northern California, but I never truly adjust to it. I have lived here all my life, and you would think that the heat would be something I would tolerate, simply because this is normal. Wrong! The heat seems to become less tolerable with each passing year, and I don’t think the climate has really changed much. One way I beat the heat, is by making salads often. Another food that I enjoy in warm weather (any time of year, actually) is Japanese food. Have you ever noticed that there are not too many heat-up-the-house-with-the-oven dishes found in Japanese cuisine? They know how to ‘cook’ for hot weather, so I take many tips from them. Makes it so much easier to follow their diet when their food is absolutely delicious to boot. 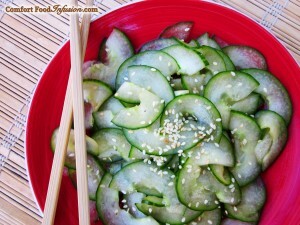 This cucumber salad, or Sunomono in Japanese, is one of the great recipes I make when I want something cool. This simple salad works great as a side dish or salad with any meal, not just a Japanese one. Cool and delicious salad of cucumbers, dressed with soy sauce and vinegar. Cut cucumber in half, lengthwise. Most cucumbers should be seeded- using a spoon, gently scrape out seeds and discard. Thinly slice the cucumbers with a knife or mandoline. In a small bowl, combine sugar, soy sauce (or tamari), rice wine vinegar, sesame oil, salt and pepper, and mix well. In a separate medium serving bowl, add sliced cucumbers. Pour the liquid mixture over cucumbers. Mix gently. Let marinate for at least 20 minutes in refrigerator. I don't peel English cucumbers, but I would suggest peeling traditional cucumbers.